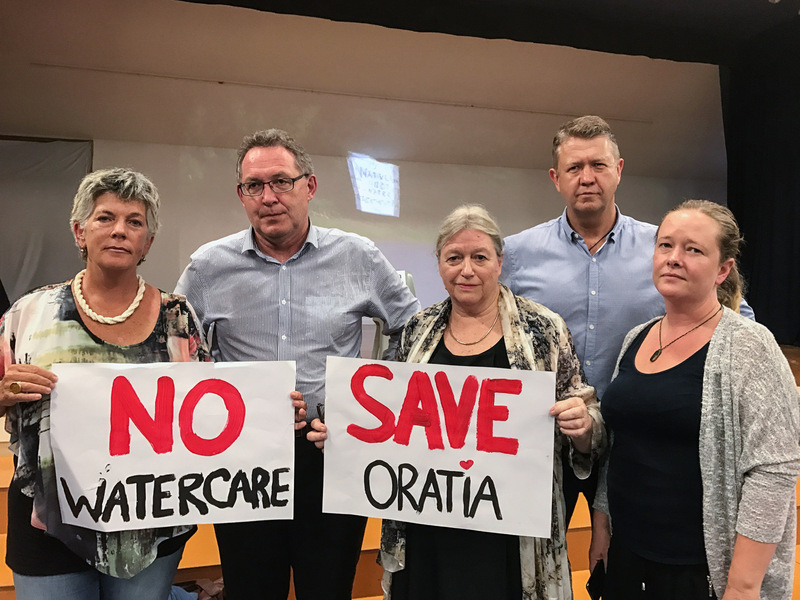 The past month has been dominated by news that Watercare is considering two sites for a new water treatment plant and that Exhibition Drive in Titirangi may be under threat. The old plant in Woodlands Park is reaching the end of its natural life and will need replacement fairly soon. And this has caused Watercare to review its land holdings in the area. Auckland’s water supply is not as secure as it could be. Rampant population growth is putting huge pressure on existing infrastructure. And as I type this Aucklanders are being asked to preserve water because the Ardmore Station is struggling to handle heavily silted water caused by some rather extreme weather events over the past week. Doing nothing is clearly not an option. And taking the current plant off line and then rebuilding does not appear to be feasible. Auckland would be another severe weather event away from water rationing unless more Waikato water can be accessed. And I am not sure this can occur. But the options that have been provided by Watercare pose all sorts of problems. There are essentially two sites, one in Parker Road, Oratia and the second in and around the existing treatment plant site. I do not believe that rebuilding completely on the current site will work although it should be used as much as possible. Choosing the Oratia site would cause huge damage not only to a very pleasant and beautiful valley but also to a local community with a very proud history deeply associated with the land. I have received a number of emails from local residents which talk about this history, their family’s links to the area and the social devastation that would be caused if they were uprooted from their land. Their nervousness and potential sense of loss is palpable. And you only have to drive round Oratia or have attended one of the very well attended and managed local meetings to recognise the local passionate opposition that has resulted from the announcement of the possibility of the plant. A large water treatment plant would be totally out place if built in the proposed area. The disruption that would be caused by its construction and operation is barely fathomable. There has to be a better alternative. The other option is to build on the site immediately adjacent to the current site. The site is bush clad although much of the bush is regenerating. There is some significant bush in the area however including that around Clark’s Bush Walk. There is a magnificent Kauri which may be 1,000 years old although from what I have been able to ascertain it is thankfully well away from the Watercare land. There is some local opposition to the idea of clearing the bush but I believe that as long as the plant is sited sensitively and high quality vegetation and trees are avoided then this site can be made to work. There will need to be a full ecological assessment completed however so that the site can be properly understood. There is also the Nihutopu Filter Station at the start of Exhibition Drive which could be renovated and used as well as large parts of the existing site and plant. Watercare’s engineers are clever people. I am confident that they can design a new plant that will be sympathetic to significant trees and the local ecology and based on my current understanding this would be the best result. A third alternative is for Watercare to back the truck up a bit and to consult with local communities and the local board about the issue and explore all options. I am not a fan of large scale engineering solutions. Often small solutions can provide superior results. Being presented with the plant has to be this big and we will not talk about anything else is deeply annoying to local people. A closely related issue is the future of Exhibition Drive. This is a very well used and cherished walkway in Titirangi that is frequented by locals. It connects Titirangi with the Arataki Visitor’s centre and can be said to be the real start of the Hillary Trail. Watercare considers the land to be surplus to requirements and suitable for divestment. It is currently negotiating with Auckland Council for the sale of the land to Council to then be held as a reserve. The land was as far as I can tell acquired under the Public Works Act. This means that if land is considered to be no longer required it is offered to other government or council departments, then generally to the previous owner or their successors, and then there is the possibility of sale on the open market. Of course Watercare does not have to go through with this and can decide to keep the land if discussions with Council do not work out. But this is the problem. Watercare is required by law to keep the price of water as low as possible and it is not able to pay a dividend to its owner, which is Auckland Council. If it starts the formal divestment process then it may have to follow it through to completion. Holding onto land it no longer needs would appear to be in breach of its requirement to act in an economically prudent manner. And in my experience Watercare is overly fixated on its commercial responsibilities. On Auckland Council’s side the strained budgets that everyone operates under and the fact that this is not an area of high growth causes me concern. The money may not be available. It is also frankly bizarre that land that was transferred to Watercare at no cost cannot be transferred back to Council at the same price. And the land has huge social value but limited economic value as pretty well all of it is zoned conservation. There is a requirement that Watercare and other Council Controlled Organisations “exhibit a sense of social and environmental responsibility by having regard to the interests of the community in which it operates and by endeavouring to accommodate or encourage these when able to do so”. Preserving Exhibition Drive should be regarded by Watercare as being part of its duty as a good corporate citizen. Watercare has assured the local Councillors and myself that the land will not be privatised. I believe that it is important that this issue is resolved for once and for all so that a future sale is not a possibility. Thank you great. It’s great to see your thoughts on the matter! Well put Greg. I would also point out that families have already been displaced at the Waima sites. The price they paid should not be considered a “sunk cost”. I have witnessed Watercare undertake a very thorough and inclusive community consultation throughout the renewal of the Omaha Sewage Treatment Plant so i really hope they back up that bus Greg. They have right there a successful model to replicate. Seems silly not to take those wonderful learnings and apply it here. Thanks Megan. The example is there! Is it possible to use the old train station site as the area for development? Since the Rainforest Express is no longer viable there would seem to be a site that is now available for re development. It would be higher than the range set by Watercare. Probably too small as well. But good idea! The land at the RFE site can still be used for the RFE if Watercare could just allow the Council to take back the lease with easements in place. So some of us would be horrified to see the depot demolished because the RFE was “no longer viable”. Save Manuka rd! No Watercare! I agree that smaller more community sensitive options should be considered – the plant of this size has no place in our beautiful mountains! And also a question – has anyone seen Watercare Save water boards in other parts of the city? Or we are being pushed into making hasty and potentially destructive choices we don’t have to make?